Pictured from left to right: John, Ken, Joshua, Jim, Bob, Dale, Len, Daniel, Mike, Jerry, Mark, Morgan, Dale, Cheryl, Jennifer and Mike. Not pictured: Tim, Steve, Josep, Arthur, Ray, Neil, Kevin, Mark, Glenn, Joe, Sarah and Elizabeth. We are located in Beaverton, Oregon and look forward to your visit. Until then we will continue empowering manufacturers with Predator software, hardware and services. on using the best technology. What is the average tenure of Predator employees? As of 2017, the average tenure of current Predator employees is 7.5 years. 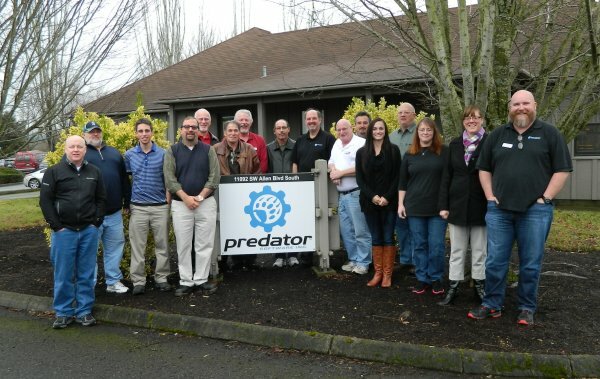 Predator employees have lots of Predator experience and manufacturing knowledge. During a 4th of July holiday, Tim Anderson, a native of the Pacific Northwest, convinced Jim Abbassian that Oregon was an ideal place to found the company. Oregon will always remain our home. Oregon is also known as the silicon forest which has a well deserved reputation for being a great place to live and work.